Baseball pitching instruction is as much about staying consistent as it is pitching mechanics. This applies to pitchers of all ages. Just the slightest change in throwing angle, or change in your stride may affect your control or velocity. The goal of pitching is to find your best delivery approach, and then duplicate it over and over again. 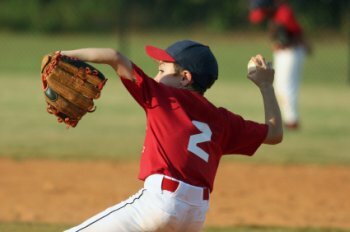 If you are just beginning to pitch, then here is my youth pitching instruction to you. Pitch from the stretch until you feel comfortable with throwing the baseball. Throwing strikes is a tough thing to do, and even harder if you are thinking about your windup motions. So give yourself a break in the beginning and pitch from the stretch. Because in the beginning stage of pitching instruction there are two big things to watch for, and they are easier to watch for and easier to correct when pitching from the stretch. 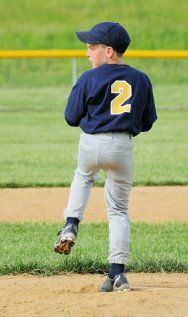 First, be sure you are striding out and getting your legs (lower body) into the pitch. If you ever want to increase your velocity to the max, you are going to have to learn to pitch with your legs. You should be able to feel yourself pushing off of the rubber. If you are a right hand thrower, then your right leg should be planted and pushing off of the pitching mound. And it would be the left leg for a left handed thrower. A team my son played on had a radar gun to check the speed of pitches. There were three pitchers on the team that were throwing about the same speed at the end of a summer season. That fall two of them went for pitching instructions and the third did not. The main emphasis of the baseball pitching instruction was pitching with their legs. At the end of the fall, the two boys with pitching instructions were throwing five to six mph faster than the third. The other important thing to watch for in the beginning is to be sure you are not short arming the pitch. By that I mean make sure your throwing arm is going back far enough behind your head and back. Infielders and catchers are taught to release the ball as quickly as possible. They soon develop a throwing motion where the hand does not go very far behind their head. 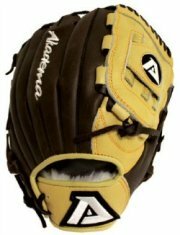 This is ok for infielders and catchers who want to get rid of the baseball quickly. But it is not the best motion for pitchers. Practice in slow motion cocking the ball far behind your back. The first couple of years work on throwing strikes and getting your windup delivery down pat. 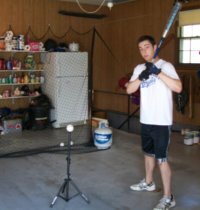 There are lots of baseball pitching instruction on the internet that talk about pitching drills for raising your leg properly and maintaining balance. If you are having a problem with that, then definitely check those out. 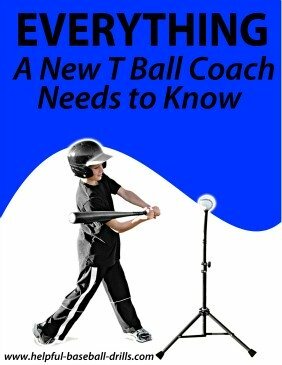 But typically your coach or dad will be able to teach a young pitcher all he needs to know for a few years. Pitching can be very nerve racking for the pitcher, his coach, and his parents. If you are the pitcher, try to stay relaxed on the mound. I know that is very hard to do. And try to learn to listen to only your catcher and coach. When you are having trouble throwing strikes, your teammates and your fans will be yelling trying to help you. But listen to only your coach and catcher. They know what is going on. As the coach, teach your pitchers to concentrate on the catcher and his mitt. And try to teach your pitchers to only listen to you and the catcher. Many other people will be yelling what they think are helpful ideas, but listening to too many people will only make matters worse. As a parent, try to stay calm and quiet. It will be tough, but it will be the right thing to do. There will be plenty of time to talk after the game.